Slim, low profile boot is no wider than an RJ45 plug. Covers plug latch for added protection. Locking prongs create a secure fit. 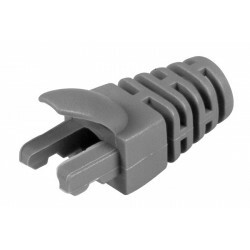 Use the 5.5mm boots with VPI's CAT5e shielded/unshielded bulk cable. Use the 6/6.5mm boots with VPI's CAT6 unshielded bulk cable. 6 mm colors: black, red, green, or gray. Use the 7mm boots with VPI's CAT6 shielded, CAT6a shielded/unshielded, CAT7 stranded, and CAT7 outdoor stranded bulk cable. Colors: black, white, yellow, gray, blue, or green.